Setting up your first WordPress theme can be daunting. It seems like everyone is using the default theme and your site needs to stick out. More importantly, your site needs to represent you. Your first step should be the official WordPress.org theme repo. It currently contains over 2000 themes and is regularly updated with new ones. Searching through 2000 themes can take awhile so WordPress built a Tag Filter to make searching a bit easier. Pay special attention to the ‘Layout’ and ‘Features’ filters for the best results. WordPress theme shops are your next best bet for quality WordPress themes. Most theme shops make their money off supports so be prepared to shell out a little cash if you find something you really like. The best part of going with a popular theme shop is the enhanced support and security. If you don’t find what you want in a theme shop your last stop would be one of a few theme marketplaces. These should be your last resort as quality and support are not backed by the marketplace and completely dependent on the theme authors. Always download premium themes from their source. Downloading themes from third parties is one of the easiest way to get your website infected with malware. If you do resort to Google to find new WordPress themes try narrowing your search to a specific timeframe. Usually within the last year will give you more accurate results. Make sure you do a background check on all themes found through Google to make sure no one else is having problems with that theme. Finally, update often. When a theme author releases an update to your theme its in your best interest to update. Whether the update introduces new features or has security patches its better safe than sorry. 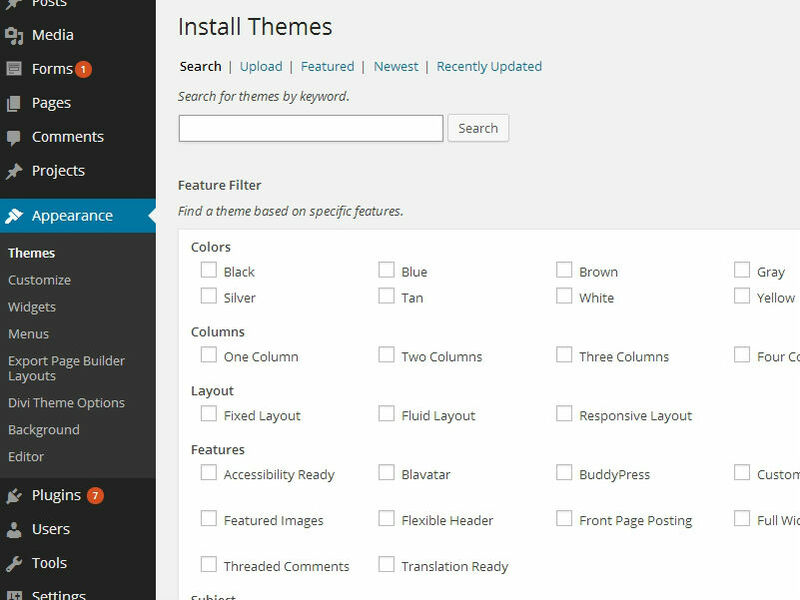 One of the bonuses of using a theme from the WordPress theme repo is you get the benefits of one click updates. Just something to keep in mind when you’re manually updating your WordPress themes. Please leave a comment with your favorite WordPress theme resource! If you enjoyed this post, please consider leaving a comment or signing up to get notified about future WordPress Workshops. Jon Bishop is the Manager of Creative Technology at AMP Agency. Jon maintains several plugins in the WordPress plugin repository, helps run the Boston WordPress meetup and spends the rest of his time blogging at JonBishop.com and the AMP Agency blog. WordPress is the world’s most popular content management system and a powerful platform for your business’s website. Information and resources are abundant but change every day. WPBusiness.info is our effort to close the gab between businesses and the information they need to be more successful. What Is WPBusiness.info Built With?